Two-try hero Jordan Burns was full of praise for his team-mates after Bedford Blues romped to a 64-20 victory over London Welsh on Saturday afternoon. 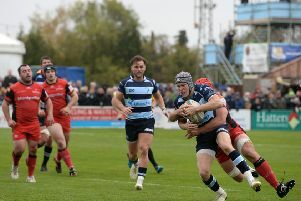 Burns secured two out of the nine tries that the Blues scored against the Exiles in what was expected to be a close encounter before Bedford ran riot in a dominant performance at Goldington Road. Burns said: “Our first half performance was really good, playing up that hill can prove difficult but we know how to do it and we used it as an advantage going in to the second half. “They put us under a lot of pressure during the early stages but we looked to gain motivation out of it”. “We kept our focus on our initial plans and it all seemed to open up for us exactly like we planned”. The Blues have been playing some terrific, fast-paced running rugby throughout the Championship campaign so far and this proved to be possibly the best performance yet from Mike Rayer’s men. Bedford went in to Saturday’s game off the back of two impressive performances in the B&I Cup, with victories over Scarlets Select and Ulster A, and they certainly looked highly motivated throughout Saturday’s victory. Throughout Bedford’s season we’ve witnessed some really pacy play from their backs which proves difficult for the opposition to deal with, and this was exactly the same. Burns added: “We set our sights on a victory in this match after two good performances in the B&I Cup; it’s nice to welcome back the Championship campaign with a victory.